Subwoofers are a wonderful addition to any music system and a necessity for home theater systems. The MCS-88 provides the essential low frequencies needed to thoroughly enjoy your favorite album or movie without sacrificing critical floor space. 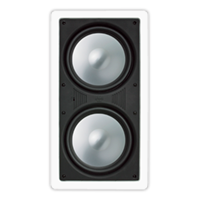 The MCS-88 utilizes the wall’s internal space as its enclosure, and the dual aluminum cone 8-inch woofers add intense bass enjoyment to your home theater.